On the election of Sepp Blatter for a fifth consecutve term as president of FIFA in the face of recently-exposed deep-rooted and historically embedded corruption within FIFA, by agents of that epitome of spotless morality the FBI ..and the arrest of 14 of world football’s top executives. Sepp Blatter, in his pomp, appeared even more non-stick than the war criminal at large Tony Blair. Latest in our “ Scrunch Flex Portraiture” series, first conceived as a new sub art genre by Michael St. Mark. .” Scrunch Portraiture” .. invented by the artist in 2007, is an infinitely flexible method of altering hard copy photo portraits into manyfold bizarre and fanciful expressions, acutely responsive to the artist’s inner sensibilities. Linkback to 2011 Work featuring SB.. Artist John McCarthy – paints portraits directly from scrunched-up paper…. ring any bells? See John MacCarthy’s “breakthrough” works of plagiarism here. 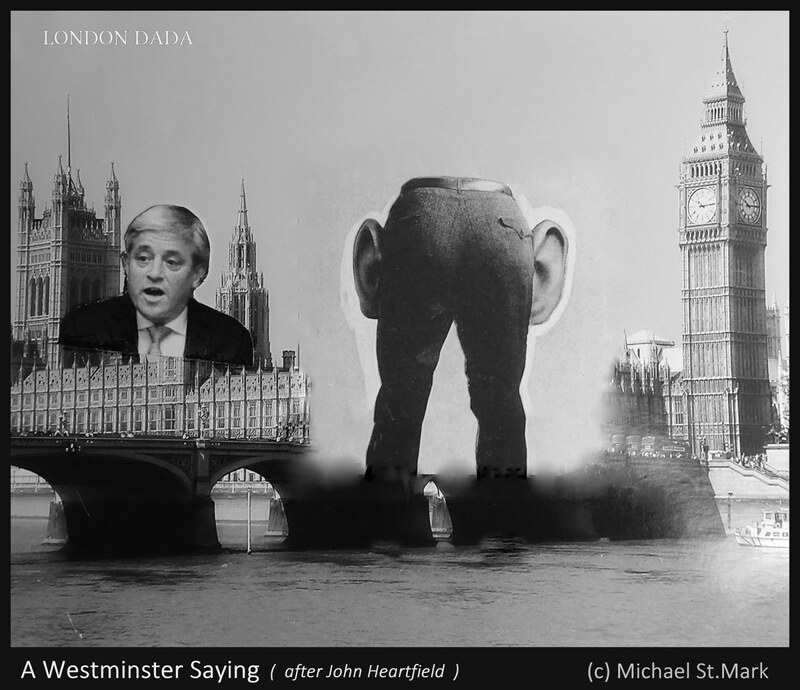 Marking the opening of Parliament post 2015 General Election and 5 more years of verbal flatulence. 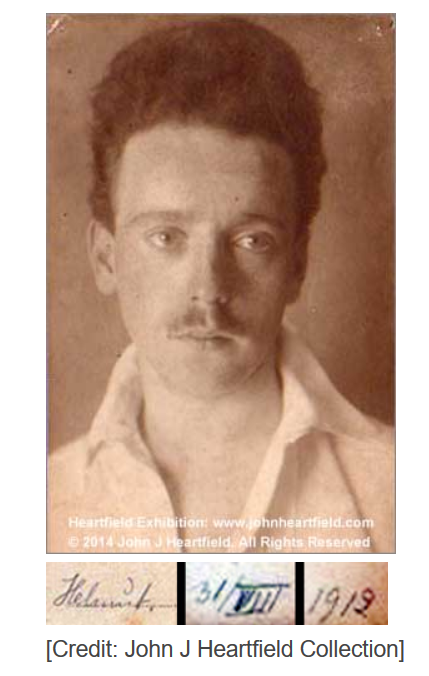 Berlin Dada’s John Heartfield at 21 – the beautiful soul of the genuine artist. Offered as an edition of x25 Lightjet prints on Kodak Pro Endura. Original ( without copyright license ) £2,300. “dragged back” to his seat. The world’s oldest and some would say most idiotic anachronism but hey, that’s Parliament in one. To coincide with David Hockney’s Painting and Photography exhibition at Annely Juda gallery, London W1. Running until the end of June. during the Labour Party conference in Brighton, September 2005. Dadaist Art Axis is here asserting that the shape, texture, color and form of Hockney’s own exhaled smoke in the photo can be legitimately considered to be an actual artwork by Hockney himself, until now undiscovered or unrecognized. This astounding perception, along with appropriation of an edited crop of David’s exhaled smoke in the photo, digitally enhanced and enlivened by SFX to resemble a dragon’s head, gives Art Axis a legitimacy to claim one half of the copyright to this Work. 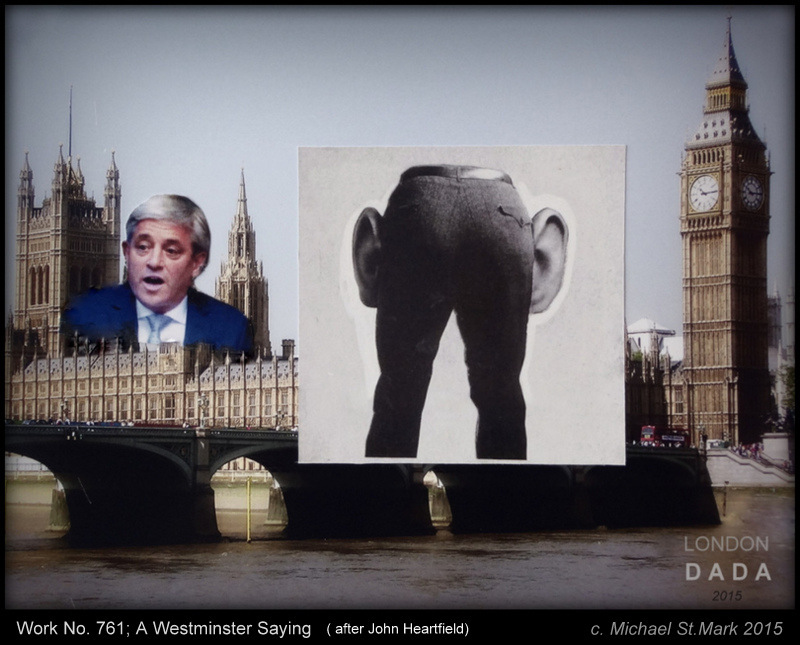 London Dada awaits DH’s agent’s response and permission to sell the Work with sale proceeds to be shared equally. An opportunity to invest in an original – unconscious though valid – David Hockney artwork. 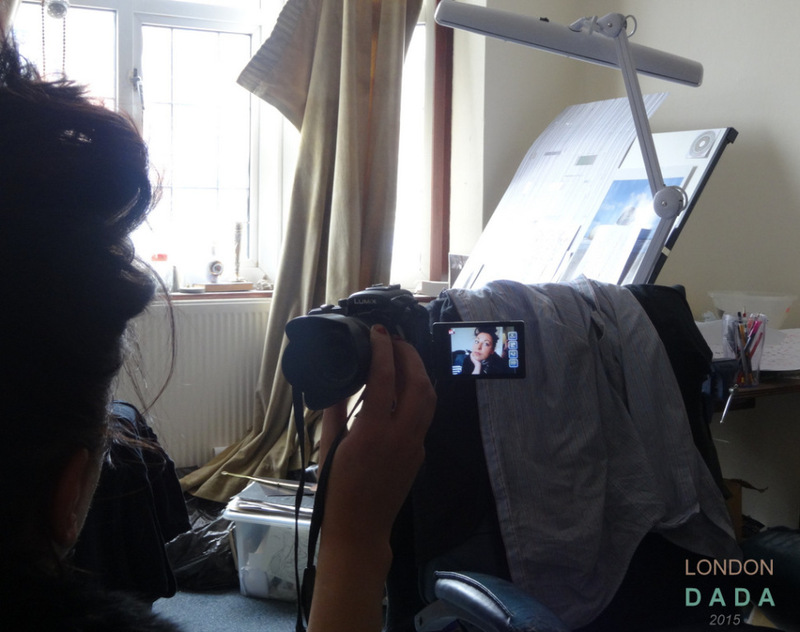 Self-portrait using digital SLR camera with reversable LED display screen and second tripod mounted camera on a 10sec. shutter release timer. Second in the series. 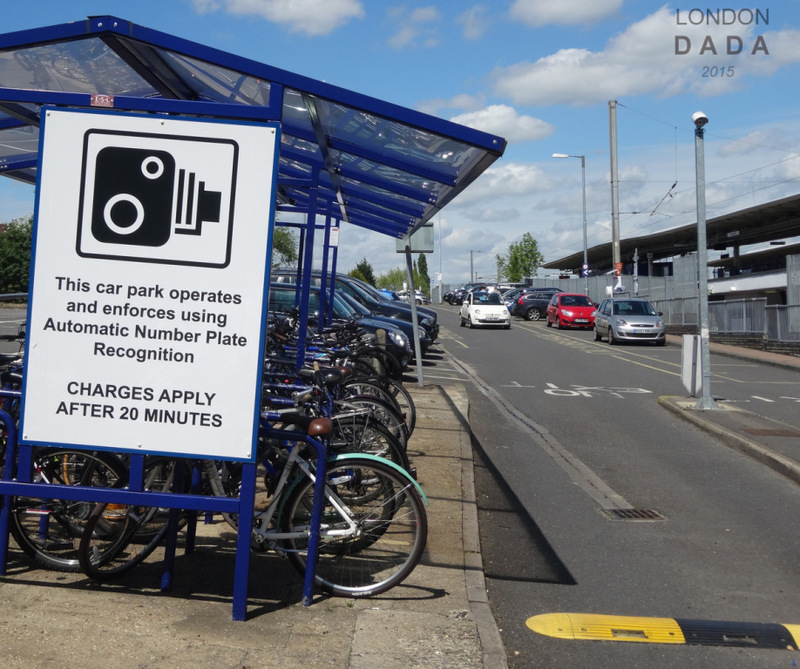 Comment on the recently-introduced Parking Eye system throughout the country.